Car buyers switching to two wheels? | What Car? Car buyers switching to two wheels? Car drivers are shunning their vehicles in favour of motorcycles. Well, so say motorbike manufacturers. Car sales slumped 13% last month compared with2007, whereas motorbike sales were up 22%. In total, motorbike sales are 1% up year-on-year, whereas car sales are down 3%. 'Against the backdrop of the credit crunch, inflation and economic uncertainty there are signs that people are switching to two wheels in order to make daily travel and commuting easier and cheaper,' said the Motor Cycle Industry Association's Craig Carey-Clinch. 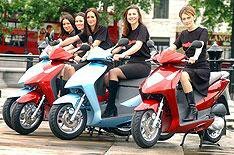 The view is supported by figures suggesting that the most popular motorbikes are scooters and mopeds, which are cheaper to buy and run than bikes.